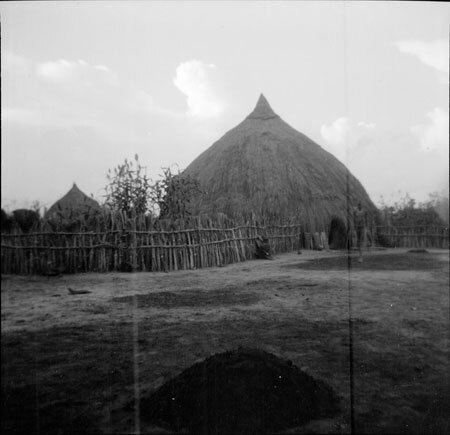 A Nuer homestead with a luak (cattle byre) and fence and a pile of dung in the foreground. Allen visited Ler for a fortnight after meeting the missionary there, Canon Ewell, on the steamer from Juba. Morton, Chris. "Nuer homestead near Ler" Southern Sudan Project (in development). 03 Jan. 2006. Pitt Rivers Museum. <http://southernsudan.prm.ox.ac.uk/details/1998.436.3.1/>.